Sickening article in the WSJ today (the link is to the abbreviated WSJ Blog; you have to be a subscriber to WSJ to read the entire piece) about the Carilion Hospital outside Roanoke, Virginia. Carilion bought the hospital on the other side of town ten years ago and have proceeded to consolidate power in such a fashion that would make the likes of Hitler and Stalin jealous. Basically, Carilion operates as a giant multi-specialty clinic with the doctors working as employees of the hospital. Doctors who elected to remain independent were quickly vanquished by an unspoken policy of "internal referral", i.e. don't be sending any patients to those guys down the street who aren't a part of Carilion. Numerous established practices dried up and were forced to relocate to other parts of the country. As a result, when you get sick in Roanoke, you have one place to go. Consequently, get ready to pay $4300 for a colonoscopy (five times what you'll pay in the rest of the country). - The newspaper reporter who was "re-assigned" after he had published a series of negative articles about Carilion. Carilion complained and withdrew its advertising from the paper; next you you know, the reporter is filing stories for the traffic beat. -The Carilion board members benefitting financially from the construction of a new clinic complex via a shady back door contract bidding process. -The vicious nature of Carilion's collections process. "In its fiscal year ended September 30, Carilion says it sued 9,888 patients, garnished the wages of 5,478 people and placed liens on 3,920 homes." Non-profit indeed....This from a hospital that collects a cool $50 million in tax exemptions every year. I was involved in a quintessentially typical case of acute embolic mesenteric ischemia recently. This devastating disease is the bane of vascular and general surgeons. Despite all the advances of modern medicine, the mortality for acute mesenteric ischemia has remained 70-90% for over 25 years. Unfortunately, my patient was a victim of the statistics, expiring despite 48 hours of dogged perserverance by everyone involved in her care. She was a 89 year old lady who presented to the ER with several hours of severe abdominal pain. Her history included atrial fibrillation (a-fib) but she had been taken off coumadin (blood thinner) because of persistent bleeding issues. In a-fib the heart flutters irregularly which predisposes one to the formation of blood clots in the atrium. These blood clots can fragment, shooting little pieces of clot into the general circulation, like surface to air missiles . The danger is that these clots (emboli) will lodge into a terminal artery branch causing ischemic damage to the tissues being supplied. Most commonly, the embolus will lodge in a branch of the cerebral circulation causing an embolic stroke. Alternatively, the embolus will occlude the superior mesenteric artery, just distal to the take-off of the middle colic artery. Other than the duodenum and the first foot or so of jejeunum, the SMA is the main blood supply of the entire length of the small intestine. SMA occlusions are more dangerous than heart attacks. 26 feet of dying bowel don't give you a lot of time to intervene. My patient was classic. She had "pain out of proportion to physical exam". No peritoneal signs, but she couldn't get comfortable, needed dilaudud every 20 minutes. Her lactate was also elevated and her WBC count was over 20k. I sent her for a STAT CT angiogram which showed a classic cut-off of the SMA just distal to the middle colic branch. I called the OR. I called our vascular surgeon. But she was 89 years old. What were her chances, realistically? There's no answer to those kinds of questions, I have found. People always want numbers. What percent chance do I have? I try to be as honest as I can. There's no reason to bury the truth under a deluge of numbers and odds. Most people die from this problem I told the patient and her family. It's a tough spot we're in. At her age, the odds aren't good. The patient winced again. I motioned the nurse for more dilaudid. Try and fix it, she whispered. Try and fix it. I looked at the CT again. There was no evidence of portal venous gas or pneumotosis (indicators of irreversible bowel necrosis). She hadn't yet developed peritoneal signs. Maybe if we....basically I talked myself into it. Try and fix it, she had said. So we went to the OR. She had had multiple previous operations. I spent the first 30 minutes delicately, but as expeditiously as possible, sharply excising adhesions with the knife. Finally I was able to free up the transverse colon mesentery and I started the dissection of the SMA. The bowels were dusky and blue-hued, but lacked that distinctive scent of frankly necrotic bowel. But the clock was ticking. Every minute that passed led to progressive injury of the oxygen starved bowel. The SMA was isolated and controlled. The vascular surgeon then did the embolectomy with a Fogarty catheter, scooping out large chunks of blackened gelatinous clot. Pulsatile flow was re-established. The SMA was sewn up and the clamps were removed. We watched the bowel. Within seconds, the bruised, pallid appearance changed to a fleshy, vibrant pink. It was a sight to behold. But were we too late? Ian Kinsler, the second baseman for the Texas Rangers, just got put on the disabled list for the rest of the year because of a "sports hernia". Ian Kinsler can wield some wicked lumber. He leads the American League in hits and runs. So why is he out for the year? What is the deal with this "sports hernia" business? It just so happens that I had a conversation with my pretend friend the other day about this very issue. Here's a transcript. Sports hernia? Sounds cooler than a regular old hernia. Let's get something straight. Sports hernias are not hernias. A hernia is an abnormal protrusion from one body cavity into another. Think of the body as multiple hollow cavities lined by muscle and tough fibrous tissue. Any weakness or defect in this lining can lead to a hernia. With true hernias, you'll see a bulge or a lump, especially with coughing or straining. So sports hernias aren't a defect? Not at all. The actual name for the syndrome is athletic pubalgia. If you read twenty articles on sports hernia, you'll find 20 different descriptions of the cause and presentation. That's usually a red flag in medicine. It means, we don't know what the hell we're talking about. How do you know if I have a sports hernia or a real inguinal hernia? An inguinal hernia is easily appreciated on physical exam. A bulge will be present at the external ring opening or the inguinal floor may protrude with coughing. Sometimes the findings are subtle but if there is any doubt, my policy is to assume that the patient's symptoms are likely secondary to some other cause. Sports hernias do not have consistently characteristic findings. Other than pain with palpation, you will not identify a bulge or protrusion. Sports hernias are a diagnosis of exclusion. MRI's and CT scans are done to rule the existence of other causes, like osteitis or muscle tears or inguinal hernias. There is no pathognomic radiographic finding. What would do for a guy with a sports hernia? Then why are all these high profile athletes rushing off to surgery for their sports hernias? Because professional athletes don't like to hear that the pain they're having is some sort of vague, non-specific muscle strain that will only heal with months of rest. They want a solution. They want a plan of action. They want to get back on the field as soon as possible. So it's reassuring to find a surgeon who can tell them they have a "sports hernia" and that the treatment is a "special surgery". And that recovery from the surgery will take months. Interestingly, many authors describe tears in the muscle, fascia, or aponeuroses as the causes of groin pain. But the majority of general surgeons are trained to palpate or visualize wide holes or defects in the aponeuroses of the inguinal region. To a trained eye or finger, these small tears may appear as bulges or asymmetric findings on physical examination. On the other hand, these tears may not be diagnosed until surgical exploration is performed. Although several series describe a variety of tears and even microtears, there appears to be a lack of pictures or even line drawings detailing these injuries. Even using the magnification offered through laparoscopy, the literature does not provide a variety of pictures detailing these inguinal tears. The best treatment for sports hernias is nature's own -- to lay off the offending activity and rest for a period ranging from a few weeks to a few months. It is also useful to engage in exercises that strengthen the abdominal muscles and increase their flexibility. This course is especially effective for professional athletes; because they are young and strong, they tend to have tremendous recuperative powers. On the other hand, they also tend to be exceptionally eager to get back in the game and seek a quick fix. But quick, reliable fixes are not to be had. While surgical procedures exist -- suturing the tear (if it can be isolated) or patching the area with a synthetic mesh -- they offer no guarantee of solving the problem or preventing its recurrence. The surgeon who taught me the most about inguinal hernias when I was a resident, Keith Millikan MD, also didn't buy into the whole sports hernia deal. Until we get better evidence (randomized controlled trials) I suspect my management of chronic groin pain won't be changing anytime soon. This article sent chills down my spine. It's an op-ed piece in the Wall St Journal written by a former lieutenant governor of New York state. And it's just frightening. Hospitals being sued are saying that their infection rates are within national norms. But for most infections, the only acceptable rate is zero. No wonder Medicare calls these infections "never events." Why should jurors reach a different conclusion in a lawsuit? Thanks to White Coat for the link. I was wondering if there was anyone of rational mind and character who thought the implementation of the new "Never Events" policy of Medicare/Medicaid was a good idea. Little did I know, that special someone was located right here in my neck of the woods. Diane Suchteka is the healthbeat columnist for the Cleveland Plain Dealer and yesterday's piece detailing the new policy was just mindboggling. Enough is enough, she says. Save us from these awful hospitals and doctors who willfully harm us! "These are conditions that are considered preventable," said Michael McCauley, media director for the Stop Hospital Infections Campaign run by Consumers Union, the nonprofit publisher of Consumer Reports magazine. "If hospitals were to set up efforts to follow these longstanding practices, the vast majority of these medical errors and infections could be prevented." What's the Stop Hospital Infectious Campaign? Do they go by SHIC? Sounds like a fringe activist group to me. It's like writing a piece entitled "The Health Benefits of Anabolic Steroids" and using Barry Bonds and Mark McGwire as your sole sources. Or an article entitled "Cockfighting: Your Key to Social Networking" featuring juicy tidbits from Michael Vick. Where's the counterquote from someone actually involved in the delivery of healthcare? Giving equal weight to arguments is apparently something Ms. Suchetka isn't interested in. And there's no argument here. The whole concept of "never events" is absurd anyway. Recently, DVT's after orthopedic procedures and wound infections after bariatric surgery were added to the list. This is inexplicable. And frightening for a healthcare provider. Venous thromboembolism can occur in up to 70% of patients after hip replacement if no prophylaxis is utilized. Even with the use of heparin or lovenox or coumadin, the risk still remains at around 5-10%. All scientific papers published on DVT prophylaxis talk about risk reduction. In no work of science will you read about a method of eliminating all risk of DVT after elective orthopedic procedures. As for the occurence of wound infections after bariatric surgery, only an absolute moron would advocate the stance that such occurrences are completely preventable. We have over 60 years of scientific research on surgical site infections. There are established norms and percentages for the development of wound infections after certain invasive procedures. The number isn't zero, no matter what how sterile or careful you are or how appropriately perioperative antibiotics are given. With bariatric surgery, you're dealing with patients who are obese and who often have diabetes; the two conditions most highly associated with surgical site infections. The list also condemns things like delirium and foley catheter infections and decubitus ulcers as completely preventable. In other words, when you slide a foreign body made out of rubber through your urethra into your bladder, the possibility that no bacteria will travel along the catheter to your bladder, thus setting up an infection ought to be zero..... Those sounds you hear in the background are knives being sharpened by thousands of personal injury lawyers across the country. It wouldn't bother me so much if a piece like this appeared in some wack-job anti-medical establishment blog. But this is an article that will be read by thousands of people in Northeast Ohio. It's featured in a major midwestern newspaper. And it isn't appropriate. As a physician I aspire for perfection, but I can only aspire. The reality is that the human body is a remarkably complex machine, susceptible to a variety of uncontrollable factors. As much as we'd like to think we can standardize health care like a Ford Motor assembly line, the viccissitudes of human illness and suffering make it an impossible task. Can we be better? Of course. But to demonize adverse outcomes as "medical errors" and "preventable events" is to further alienate patients from physicians at a time when the very delivery of adequate healthcare for all is in a crisis. 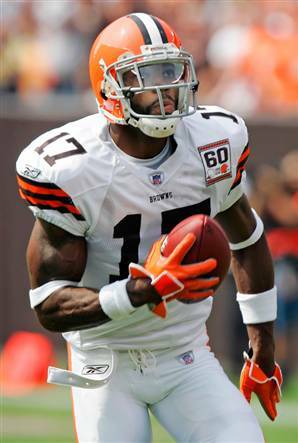 Browns Pro Bowl wideout Braylon Edwards sustained a deep laceration to his right leg after being gashed by teammate Donta Stallworth at the end of a footrace last Friday. Edwards was sprinting barefoot for some unholy reason. The cut was deep enough that he was hospitalized overnight at the Cleveland Clinic Foundation Center for Healthcare Excellence. I think that's the official name these days. Or something vaguely totalitarian along those lines. So here's what we have: Professional athlete + open wound + Cleveland Clinic.....hopefully the room he stayed in was power sprayed with liquid vancomycin. We don't want Derek Anderson's #1 target going down as the seventh Brown to acquire a significant MRSA infection after treatment at CCF. I've written ad nauseum about the burgeoning problem of having too many cooks in the kitchen with regards to critically ill surgical patients. Standard operating procedure for a patient who arrives in the ER toxic from peritonitis: Consult GI, the hospitalist, ID, nephrology, a pulmonologist/intensivist, and, what the heck, a general surgeon. Patient has a surgical problem. Patient undergoes emergency surgery. Nurses spend the next two weeks pulling out their hair trying to keep straight all the conflicting orders written on the chart from the various consultants. That's life in American ICU's. I recently wrote about a vasculopathic lady who presented with an infarcted sigmoid colon. Post operatively she sort of limped along. By post-op day #5, she still hadn't turned the corner and, in fact, seemed to be deteriorating. I just didn't like the way she looked. And her abdomen was more tender. And her WBC count kept rising. So I took her back for another exploration; sure enough, patchy areas of ischemia were apparent throughout the remaining colon, especially in the area of the cecum. I performed a completion colectomy and gave her an end ileostomy. There were palpable pulses in the mesentery, but the vessels were hard, calcified pipes. Clearly, this was a case of Non-occlusive mesenteric ischemia (NOMI), with the disease affecting the blood supply at the level of the arterioles. Classic teaching is that this form of mesenteric ischemia carries the worst prognosis because there are no real interventions to reverse the problem. All you can do is resect the dying bowel and hope the disease is limited to the colon. I wrote in the chart an honest appraisal of her poor overall prognosis. The first 48hours were rough, but she was hanging in there. The stoma looked pink and viable. She was maintaining her blood pressure. Not a perfect picture, but at least some semblance of hope remained. The hospitalist called me early that Monday. He had read the notes I left in the chart. He was picking up the patient from his colleague and he wanted to know my feelings on the overall outlook. I reiterated that, although the prognosis wasn't good, she actually wasn't doing bad, either. Apparently, a conversation ensued later on that evening between the hospitalist and the family and there was a decision to implement comfort care measures and a gradual withdrawal of all supportive care. This was a decision that was made without my knowledge. I came in the next morning and I was a bit mystified to find my patient lying alone in a darkened ICU room with all the monitors shut off, no IV's running, completely disconnected from any form of supportive care. What's going on? I inquired. They made the patient DNR-CC last night, the nurse replied. I see. So they did. I flip through the chart and read the hospitalist's note. After a discussion of the likely outcomes, the family decided to start withdrawal of care. The orders read as follows: DNR-CC, d/c labs, d/c dialysis, d/c TPN, d/c antibiotics, transfer to regular floor when bed available. At this point my temporal artery is pounding in my forehead and I've broken out in a cold sweat. But very calmly I sit down,take a few deep breaths, and I start to make some phone calls. I arrange for the family to meet me at bedside. I tell the charge nurse to give me a few hours before sending her upstairs. My patient is sleeping comfortably in bed. I check her blood pressure; 112/65. She's saturating 99% on 4liters of oxygen. She opens her eyes and smiles when I say her name. The stoma has started to put out green enteric contents. Basically I have to ask the family to reconsider probably the hardest decision they ever had to make. She's maintaining her pressure. She's breathing on her own. Her GI tract is starting to work. We may have something to work with here, I told them. I've been with her from the beginning. You know me; I wouldn't try to mislead you. I think she may have a chance. The poor husband just stared straight head, eyes glistening, shaking his head. He'd spent an hour talking to a priest the previous night, second guessing his decision to make his wife DNR-CC. In medicine there has to be a captain of the ship. One voice. One person to speak to the family. My mistake was taking it for granted that that role would fall on me, as the operating surgeon. The hospitalist, not to be too hard on him, was simply doing his job. He read the chart, spoke to me on the phone, and made a decision based on his interpretation of the situation. Perhaps he went a little too far, but in these ICU patients where there are no clearly defined boundaries for each specialist, how do you know when you've gone too far?